This page contains answers to some of the more frequently asked questions about Special Olympics. Click on the red hyperlinks for answers to those questions requiring more detailed responses. If your question is not addressed please contact us at 913-236-9290 or kso@ksso.org. To be removed from mailing or phone solicitation lists please contact Lynda Krupp, kruppl@ksso.org or 913.236.9290 x103 or 800.444.9803. Special Olympics is an international organization that changes lives by promoting understanding, acceptance and inclusion between people with and without intellectual disabilities through year-round sports training, competition and other related programming to children and adults with intellectual disabilities. Special Olympics has created a model community that celebrates people’s diverse gifts. Founded in 1968 by Eunice Kennedy Shriver, Special Olympics provides its athletes with continuing opportunities to realize their potential, develop a healthy lifestyle, demonstrate courage and experience joy and friendship. What is the Mission of Special Olympics? Children and adults with intellectual disabilities who participate in Special Olympics develop improved physical fitness and motor skills, greater self-confidence and a more positive self-image. They grow mentally, socially and spiritually and, through their activities, exhibit boundless courage and enthusiasm, enjoy the rewards of friendship and ultimately discover not only new abilities and talents but “their voices” as well. What is the Purpose of Special Olympics Kansas? How does Special Olympics Kansas relate to Special Olympics overall? How many people does Special Olympics Kansas Serve? Currently there are over 5,100 athletes participating in programs throughout the state. What is an “Intellectual Disability”? What is a Down syndrome addendum, and why do I need it? A condition exists in about 10% of all Down syndrome individuals known as Atlanto Axial Subluxation, it is a weakness between the 1st and 2nd vertebrae in the neck. Athletes who have this condition may be seriously injured if involved in certain activities that over-extend the neck muscles. In order to protect the athlete, Special Olympics Kansas has a policy that prohibits Down syndrome athletes from participation in athletic competition or any Special Olympics Kansas event until they have been examined for Atlanto Axial Subluxation and are cleared for participation by a qualified physician. Who is eligible to participate? Is there an age limit? To be eligible to participate in regular training and competition an individual with intellectual disabilities must be at least 8 years old and can start at any time after reaching this age. There is no upper age limit; athletes can continue to complete as long as they have a current medical release form. The Special Olympics Kansas Young Athlete® program offers one-hour sports training and motor skills development opportunities for children ages 3-7. Visit the Athlete web page for details on how to I get your child started in Special Olympics. Can my child participate in more than one sport? Individuals can participate in as many sports offered by SOKS over the course of the year as their schedules allows. How do I find out if there is a team in my area? Go to the Regions page and click on the link to the region where you live. If there is no team in your area and you are interested in starting one please contact the Tim Rehder,rehdert@ksso.org at the Headquarters office at 913.236.9290 x108 or 800.444.9803. Special Olympics Unified Sports® is a program that brings together athletes with intellectual disabilities and their peers without intellectual disabilities (called partners) on the same team for training and competition. Age and ability matching of athletes and partners is defined on a sport-by-sport basis. Visit the Unified Sports webpage to find the Unified sports offered in Kansas. The Law Enforcement Torch Run (LETR) is the largest grass roots fundraising effort for Special Olympics. Mostly comprises of law enforcement personnel, the LETR hosts various fundraisers throughout the year to raise much needed funds and awareness for our athletes. Visit our Events page regularly to find an event near you. 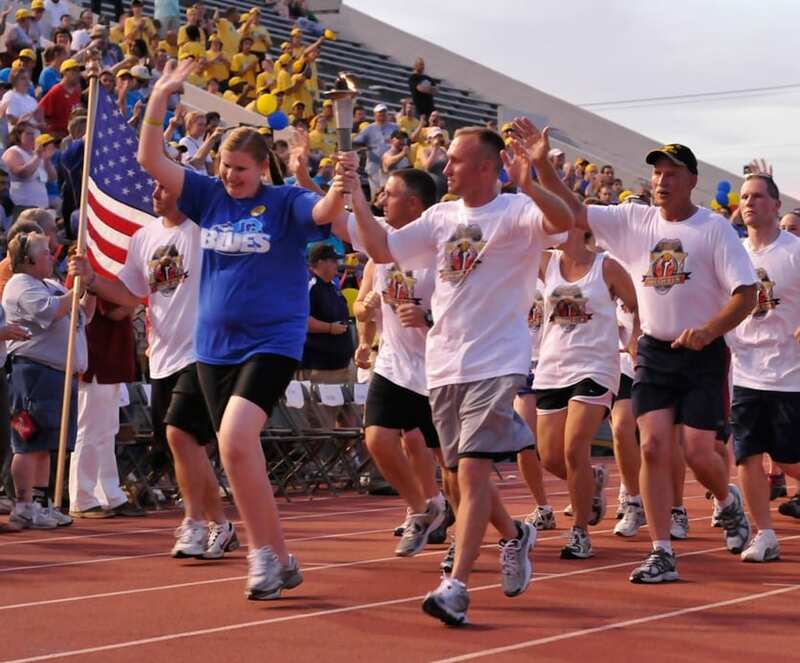 The Torch Run is an actual running event in which officers and athletes run the “Flame of Hope™” to the opening ceremonies of Special Olympics competitions. For more information contact visit the LETR webpage. You can join the SOKS Family in many ways. To be a Volunteer, or Coach, help with Special Events, or to find one of the many Ways to Give to Special Olympics Kansas click on the links. We also have Special Promotions that provide ways to give with little effort. Corporate sponsors are always welcome! From providing volunteers at events to organizing a “jeans day” for your company, we have something for every size of company. Visit our Corporate page to see the different ways to become involved. The Polar Plunge® is a fundraising event held in communities across Kansas. For a minimal donation, our supporters and fans take the plunge into the freezing waters of Kansas during January and February. For their bravery they receive our ever popular “Polar Plunge” commemorative shirt. To find a location near you, visit plungeks.org and join in the fun! Are You Using My Money Wisely? Special Olympics strives to operate as efficiently as possible. A significant portion of our revenue comes from a broad base of donors, $10 and $20 dollars at a time. Every contribution makes an important difference. Thanks to the generosity of our supporters, more people with intellectual disabilities have a chance to participate and experience the transformative powers of sports. More than 70 percent of our expenditures go to supporting program activities – including supporting regional, state, national and world competitions, outreach to recruit more athletes, Young Athlete®, Health and Wellness Programs, Healthy Athletes, Athlete Leadership Programs, Family Programs, public education and much more. Maintaining these high standards is a priority at Special Olympics Kansas. To view our Annual Reports, Audits and 990’s visit the Financial webpage. SOKS is not able to provide transportation to regular training activities or regional and state competitions. If an athlete is selected to participate in the National or World Games transportation, accommodation, food and uniforms are provided for the athletes. Do you provide support services for athletes? No, please check our Resources page for a comprehensive list of local and national organizations and services. Yes! Everyone is welcome to attend a fundraising special event. For a complete listing of events and to discover how you can get involved in the SOKS movement, visit our Events page or check out our online calendar.